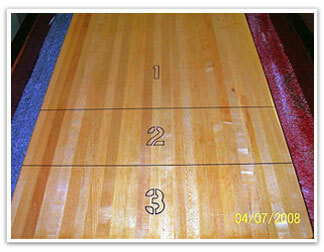 Here are some pictures of Fred Dominski's refinishing project. 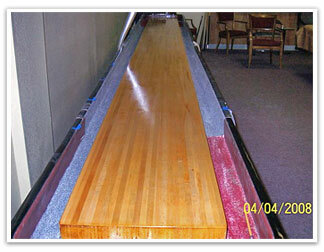 On April 15, 2008, I completed resurfacing the shuffleboard table at the Indio Ca. Elks Lodge. I believe the table is at least 50 years old because the lodge has owned it for at least 40 years and they bought it used and the stepping switches and relays in the scoring mechanism would sugest that vintage. The scoring feature is how I got started on this project. My wife and I like to play this game but have a hard time mentally keeping score. Having some experience trouble shooting and since the scorer didn't work I looked into it and found that all that was needed was the stepping switches needed to be lubricated (WD40) and a few light bulbs needed replacement. After playing on the table for a year I decided to refinish the board because of a large blotch on the right center of the table that may have been caused by something spilled on the surface. 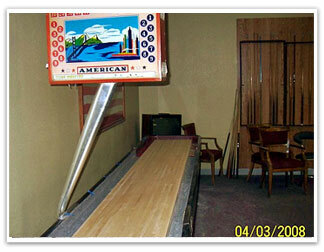 After 26 hours and $162.48 spent for materials the Lodge has a playing surface that anyone would be proud of. I started by removing the original finish with a Porter-Cable orbital five inch sander rotating a 60 grit disk. 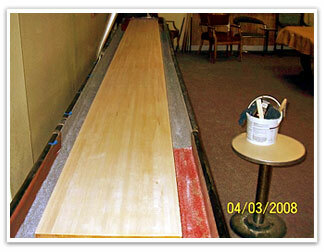 After reaching bare wood I continued with 120 grit and 220 grit sanding disks. Then I applied two coats of Zinsser Bulls Eye Seal Coat sanding after each coat with 220 grit sanding disks. After applying the sander sealer my darling wife used a Sharpie fine tip felt marker to apply the lines and numbers. It is important that the marking be applied after the sealer because the water based polyurethane won't cause the black Sharpie markings to smear. I then applied seven coats of MiniWax Water Based Clear Gloss Polyurethane sanding after each coat with 220 grit sanding disks. On the last coat of polyurethane I rubbed the finish three times with fine steel wool. I then rubbed on two coats of Meguire's Gold Class paste wax that is available at any auto store. Also between coats I wiped the surface with minerall spirits and after it dried I used a tack cloth to remove all ! the remaining dust. I then installed a rubber runner material that I bought at a Lowe's store to replace the worn carpeting at either end of the table.